PASADENA, Calif. -- NASA's Cassini spacecraft has provided the first direct evidence of small meteoroids breaking into streams of rubble and crashing into Saturn's rings. These observations make Saturn's rings the only location besides Earth, the moon and Jupiter where scientists and amateur astronomers have been able to observe impacts as they occur. Studying the impact rate of meteoroids from outside the Saturnian system helps scientists understand how different planet systems in our solar system formed. Results from Cassini have already shown Saturn's rings act as very effective detectors of many kinds of surrounding phenomena, including the interior structure of the planet and the orbits of its moons. For example, a subtle but extensive corrugation that ripples 12,000 miles (19,000 kilometers) across the innermost rings tells of a very large meteoroid impact in 1983. "These new results imply the current-day impact rates for small particles at Saturn are about the same as those at Earth -- two very different neighborhoods in our solar system -- and this is exciting to see," said Linda Spilker, Cassini project scientist at NASA's Jet Propulsion Laboratory in Pasadena, Calif. "It took Saturn's rings acting like a giant meteoroid detector -- 100 times the surface area of the Earth -- and Cassini's long-term tour of the Saturn system to address this question." The Saturnian equinox in summer 2009 was an especially good time to see the debris left by meteoroid impacts. 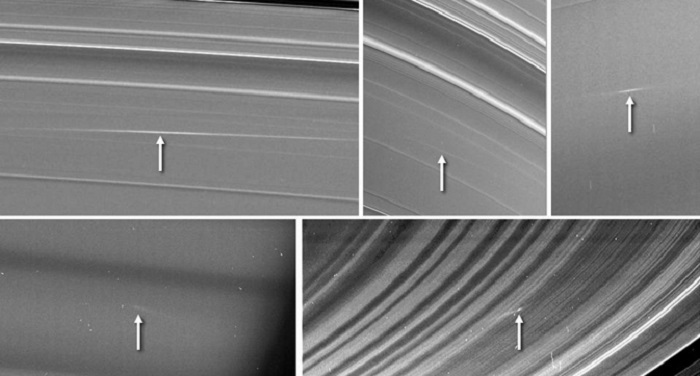 The very shallow sun angle on the rings caused the clouds of debris to look bright against the darkened rings in pictures from Cassini's imaging science subsystem. "We knew these little impacts were constantly occurring, but we didn't know how big or how frequent they might be, and we didn't necessarily expect them to take the form of spectacular shearing clouds," said Matt Tiscareno, lead author of the paper and a Cassini participating scientist at Cornell University in Ithaca, N.Y. "The sunlight shining edge-on to the rings at the Saturnian equinox acted like an anti-cloaking device, so these usually invisible features became plain to see." "Saturn's rings are unusually bright and clean, leading some to suggest that the rings are actually much younger than Saturn," said Jeff Cuzzi, a co-author of the paper and a Cassini interdisciplinary scientist specializing in planetary rings and dust at NASA's Ames Research Center in Moffett Field, Calif. "To assess this dramatic claim, we must know more about the rate at which outside material is bombarding the rings. This latest analysis helps fill in that story with detection of impactors of a size that we weren't previously able to detect directly."